All images ©DC Comics, Inc. except where noted. This time we focus on the origins of the Superman logo. Above is an early incarnation of the character created by Jerry Siegel and Joe Shuster, from 1933, before it was a comic. Siegel and Shuster were science fiction fans, and their world-famous creation owed a lot to science fiction stories they had devoured as teenagers. Even at this early stage, Joe Shuster is working toward the logo idea that eventually appeared on his first comic book covers: the heavy block letters receding and curving away to the right, with deep telescoping (the three-dimensional effect) going to the left, though here the shapes taper toward a single perspective point somewhere left of the center of the S. The “THE” is way out of proportion, but you can see he had an idea of what he was after. I also have some ideas about what might have influenced his design. 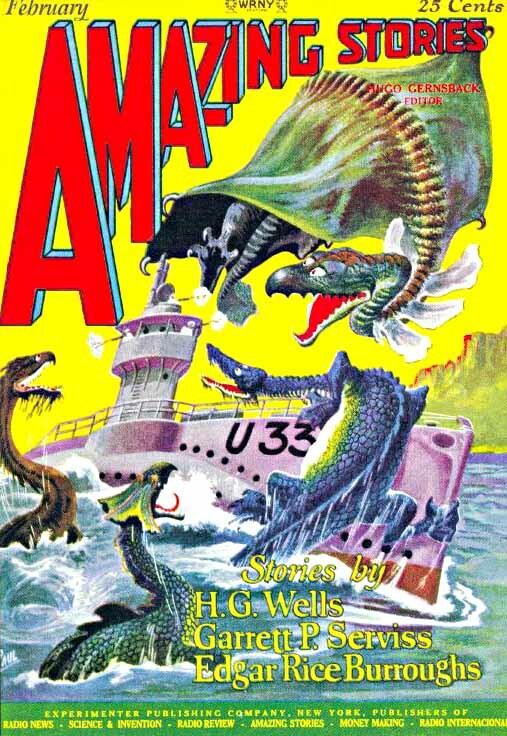 AMAZING STORIES was one of the oldest and most popular science fiction pulps, one that Jerry and Joe would have been very familiar with. The logo here isn’t terribly close to what Joe was doing on Superman, but it does have giant floating letters and telescoping. Here’s another image that I suspect had even more of an influence. 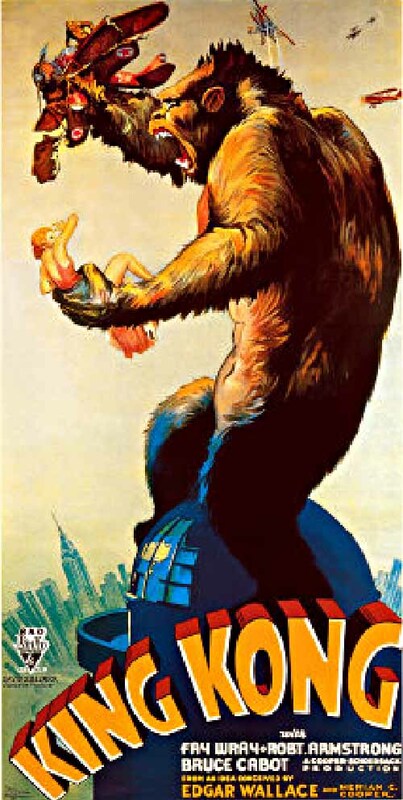 Released in 1933, Jerry and Joe would surely have seen the film KING KONG, and very likely have noticed this poster for it at the theater, or in other advertising. If we now look at the way Joe drew the logo on the first comic book issue of Superman, I think the similarity is obvious. Different angle and perspective, but even the shading on the S is similar to that in the KING KONG poster. And no doubt there were plenty of other graphic titles around at the time that played with the same techniques. These things don’t happen in a vacuum. Before Superman even appeared in ACTION COMICS #1, though, Jerry and Joe had spent several years trying to sell it as a newspaper strip. I imagine the first panel of that strip, seen below, which later became the first panel of the story in ACTION 1, was created some time after 1933, perhaps 1934 or 1935. Even if it was a new panel created just for the comic, released in early 1938, this shows that Shuster already had a firm idea of what the Superman logo should look like well before it ever appeared on a comic book cover. The only problem was, Shuster didn’t really understand that a logo is supposed to be exactly the same every time you see it, and he kept recreating it. Stepping back a bit, Superman’s appearance in ACTION COMICS was a huge success, and later that same year the publisher began to make plans to release a separate book with him as the title character. Below is the cover of the ashcan edition from 1938, put together to get the book copyrighted, and to show potential buyers and distributors what it would look like. This version of the Superman logo is actually the one I like the best of those done by Joe Shuster, though I think he should have left out the small shading lines along the tops of the letters. Now, the word COMICS shown here is NOT the same as any that appeared on the early DC covers. It appears to be a commercial font very similar to the one I showed in part 1 of this study, with the same treatment of the O. It’s pasted over what I feel certain is a version of the word SUPERMAN drawn by Shuster. 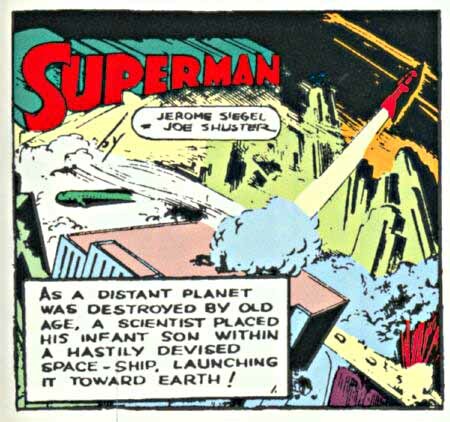 It also appeared on the cover of SUPERMAN #3, seen below. In any case, Joe Shuster was, I believe, back in Ohio creating the covers for this new SUPERMAN comic, and as he did each one, he also recreated the logo, making something substantially different each time. Here are two early examples on issues 3 and 4. After they had received a few of these, his editors must have given Joe a call and suggested that they have their staff logo man, Ira Schnapp, do a version that could be photostatted and put on every cover. It would save Joe time, it was the way things were usually done, and though they might not have said so, Joe’s variable logos didn’t make the book look good. ADDED: See my latest article on this subject HERE, giving new evidence that Schnapp designed this logo. The other side of being a logo designer is being a logo doctor, as has happened to me countless times. An editor, artist or art director will come to me with a logo that someone has done. They like it, but it needs some help, needs to be made more professional-looking. That’s exactly what Ira Schnapp did here, bringing his background in classical letterforms to the job, as well as a solid knowledge of perspective and lighting. In fact, the Schnapp SUPERMAN logo is really quite an excellent and complex piece of design work, with attractive letterforms and subtle three-point perspective. There is one firm vanishing point which you can find by following the sides of the telescoping, and two more implied ones: one to the right following the narrowing curves of the letters, and one infinitely far off to the bottom that allows us to see the top and front of the forms at the same time. Schnapp’s handling of the shading on the S is also masterful. The one place where I think he might have reconsidered are in the open areas of telescoping inside the E, which I think would make more sense blacked-in, in shadow. I imagine Joe Shuster would have been pretty happy with this version of his logo idea. It’s a classic, one of the most distinctive comics logos of all time, and it survived virtually unchanged well into the 1980s, an amazingly long time for any logo. 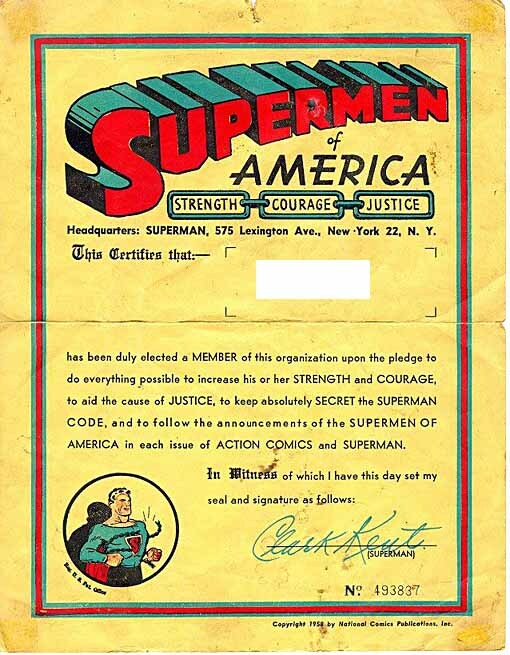 As you can see it used one of Joe Shuster’s Superman logos from the earliest issues of the book, and the copyright date on this letter is 1958, so the revised logo must have been done after that. Still interesting to see at least part of an original Schnapp Superman logo! Next time I’ll look at how the Action Comics and Superman logos developed and changed further as the years went by. This entry was posted in Logo Studies on August 8, 2007 by Todd. One thing I’ve wondered about for a long time is why in the mid-’80s DC decided to change the angled outer bowl of the U (as we can see, something that was a feature of the logo almost from the very beginning) to a rounded one — a change that persists to this day. Perhaps you can shed some light on the topic. Yes, I’ll be addressing that Superman logo revision in an upcoming installment of this logo study. This is a fantastic review–I learned about Ira Schnapp from Dial B for Blog and am entranced with learning more about the mechanics of the design. Todd, I have to ask–you tell the great story of how you found the original logo. I know you were “cleaning out” the file cabinets . . . did you throw it away? (Heaven forbid!!). No, I simply reorganized and alphabetized the files, removed damaged or extra copies (not originals), and put everything back in the drawers. I don’t know where those logo files are today, but probably still somewhere in the DC offices, or in storage perhaps, as most of the logos were digitized in the 1990s. Hope that Superman one is still there, but I wouldn’t want to bet on it. I have to admit I kind of wish I’d taken it home, after making lots of photostats for the file, of course. It wouldn’t have been the right thing to do, though. I’m really enjoying this look at the logo design of my favorite superhero character. Lots of interesting information. Also wanted to thank you for the great bookmarks that you sent. Thanks, Jeff, and glad you got them. Pingback: Blog@Newsarama » Klein: Look, up in the top of the cover! Once again, we score a ton of thoughtful, well-researched and objective analysis of comics logos. In addition to artistic issues, you also expose the business environment that influenced them. Thanks again for sharing this reference. I’ve tried to recreate the Superman logo using Illustrator, and have come up with a kind of recipe. I don’t have the correct font (Comicraft have created one called “Up Up And Away” which is very good). I ended up using Franklin Gothic Standard, Roman No. 2. One thing I noticed when changing the perspective using the 3D part of Illustrator is that the “S” seems to look wrong. In looking at the original logo it seems to me that the “S” is not in perspective as much as the rest of the characters. If you discount the telescoping behind it, it almost looks straight on. Here is my re-creation which I am still not totally happy with – the “S” in particular looks too fat because of the perspective. The original was drawn by hand. I don’t find your version very close as far as the letterforms go.